Tall and blonde with a creamy complexion it stood like an Yummy-Mummy in a shiny black SUV, looking down on the traffic of cakes around it. A modern two storey twin set of pastel hues overlaid with a filigree of icing, this Brown’s vanilla slice had built its vocation on good looks and being in the right places. 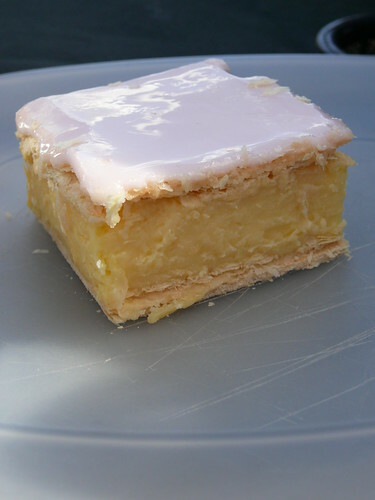 Technically it was fine – creamy with decent pastry and attractive icing – but the flavours were as beige as a Bayside Mansion’s feature walls. Cumbersome and uptight, it was as big a disaster to navigate as a Porsche Cayenne in school gate gridlock. With custard like Prozac, this was just another ding in the fender on the road to perfection. Brown’s Bakery 1/101 Dundas Place, Albert Park, Victoria. Australia. Like a two-bit heroine in a 1950’s B grade melodrama, the icing flattened itself to the paper bag and clung on for dear life. As though dragging a wench in fishnet stockings across the floor, the paper came away with a thick coating of sweet white icing emblazoned with a diagonal chocolate slash. 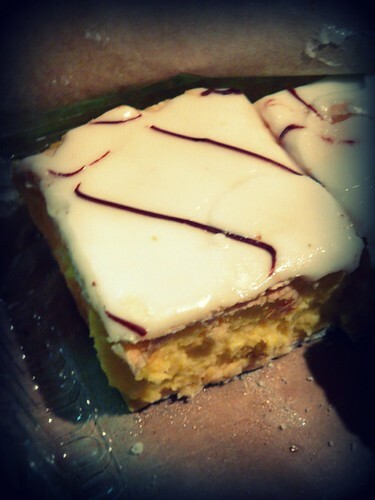 And like all messy drama queens this vanilla slice was hard to handle, flaky and oozing sensuously. Wicked temptation yielded momentary pleasure, creamy egg custard was licked off sticky fingers and the quality pastry diverted attention from the soft vanilla icing. And then just as quickly it was over, distant like a cheap memory, with minds set on the next conquest. Woodend Bakery Cafe 122 High Street, Woodend, Victoria. Australia. An audible gasp, a look of disbelief….applause….what a delivery! After dismissing a couple of vanilla slices in the wake of the Beechworth Beauty, we were desperate for something special. A month had passed but there had been no runs scored in our test. 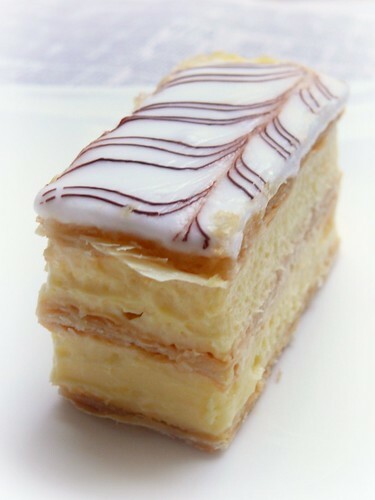 Then instead of another duck came this – the back to back, Grand Champion of The 2006 & 2007 Great Australian Vanilla Slice Triumph, professional section. Currently rated Australia’s Slice of Perfection, and rightly so. 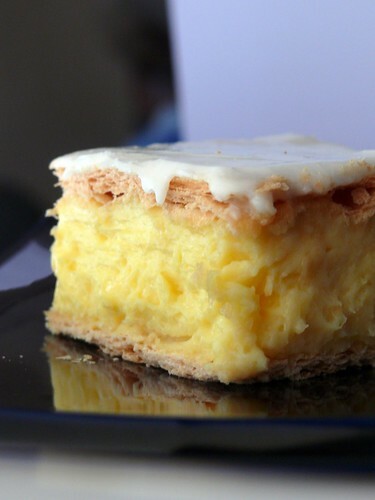 The custard and pastry were perfect; a sweet, soft, eggy vanilla cream sandwiched between wood fired crisp, unsweetened buttery pastry and topped off with a meltingly soft, sticky icing. The runs were back on the board and we instead, had been bowled clean over. Sensational! Tatura Hot Bread 130 Hogan Street, Tatura, Victoria. Australia. Beechworth Bakery 27 Camp Street, Beechworth, Victoria. Australia. “Our family hasn’t stopped baking since 1852” read the sticker on the pack…and boy must they be tired! Their slices definitely were. 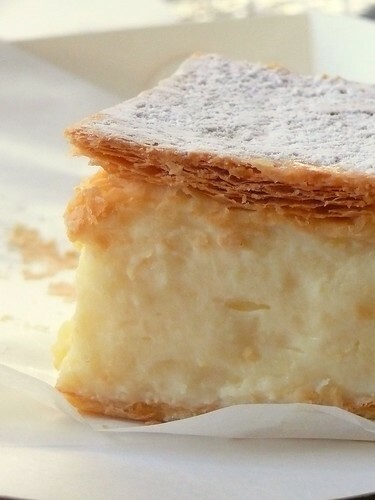 This Victorian era pastry arrived with a wet top of melted icing sugar crowning it like the cap of a sweaty old cook, while a layer of damp pastry strayed from under the crown like a mad woman’s blouse. The custard had a pleasant eggy flavour highlighted by vanilla essence, but the copious amount of cornflour used made it firm to the point that it became a menacingly bulging muffin top when the fork hit the impenetrable pastry. It then bounced back into shape. 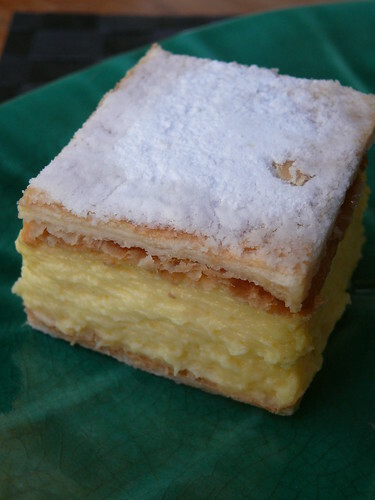 This Vanilla Slice posed a conundrum: the fatty tasting pastry could not be eaten with a fork and the custard could not be eaten without one. Had this graced the parlour at tea time, Her Majesty would not have been amused. Delbake 478 Centre Road, Bentleigh, Victoria. Australia. Tall and handsome, this Casanova seduced with its fine looks. Capped with a marbled icing it reeked of class and whispered invitingly, “I’m the one you’ve been dreaming of. Just lick me”. But like a Don Juan, after the seduction it was callow and disappointing. The icing hit the tastebuds like a sycophantically sweet cajoling. 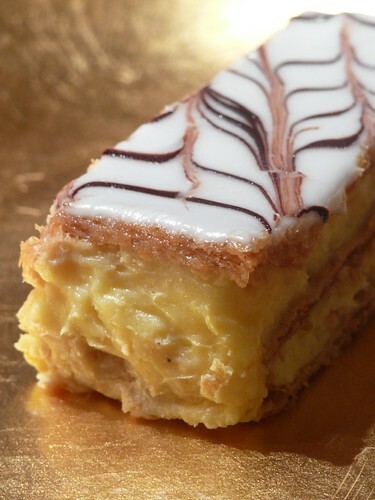 The pastry tasted good but was soft and sloppy like a teenager’s first kiss. As the tongue darted in for the custard it recoiled from a pale, sticky goo with a very pronounced flavour that was just not quite right. Was there uncooked corn starch in the mix? The fork could not pierce the icing and impossible to eat with the fingers, it left in its wake the bitterness of feeling deceived and violated by a sleazy charlatan. Jean-Pierre Gateau 1/44 Como Parade, Mentone, Vic. Australia.